Choosing the right card is important. Whether you are shopping online or shopping at your local shops, we have the right card for you. More than a card, Visa gives you the freedom and peace of mind to make things happen. From dealing with unexpected situations, to making secure, convenient purchases anytime, anyplace; Visa puts you in control of your finances – and your future. The Visa system links over a billion cardholders and more than 24 million acceptance locations worldwide. You’re in control - Simple, Safe, Convenient. Our Visa Debit Card is attached to any Transactional Account. You can use your card to access your own money thereby incurring no interest charges or we can arrange an overdraft facility to be attached to your account to enable you to make purchases on a line of credit. Simply outsmart travel money. Load up to 11 currencies and use it at millions of locations worldwide everywhere Mastercard is accepted. Load, spend and top up your card on the go, so you’re always in control. Cash passport can be purchased at your local branch. Get your Cash Passport now. Mastercard Prepaid Management Services Australia Pty Ltd (ABN 47 145 452 044, AFSL 386 837) arranges for the issue of the Multi-currency Cash Passport™ and Cash Passport™ Platinum (“Cash Passport”) in conjunction with the issuer, Heritage Bank Limited (ABN 32 087 652 024, AFSL 240 984). You should consider the Product Disclosure Statement for the relevant Cash Passport available at www.cashpassport.com.aubefore deciding to acquire the product. Any advice does not take into account your personal needs, financial circumstances or objectives and you should consider if it is appropriate for you. *Lock-in your exchange rates means the exchange rate is locked in for the initial load only. The exchange rates for subsequent reloads will be set at the prevailing exchange rate at the time of the transaction. ^Subject to any surcharge that may be imposed directly by merchants. Cash Passport is unable to be used for purchases related to gambling or adult entertainment. Currently Cash Passport cannot be used in the following countries and geographical regions due to sanctions that are currently in place: Crimea, Iran, North Korea, Sudan and Syria. If you attempt to use your card at merchants in any of these countries and geographical regions, your request will be declined. In addition, the ATMs and POS terminals are not owned or operated by the Issuer or MasterCard Prepaid Management Services Australia Pty Limited and the Issuer or MasterCard Prepaid Management Services Australia Pty Limited are not responsible for ensuring that merchants will accept the Card. For example, the Issuer and MasterCard Prepaid Management Services Australia Pty Limited cannot control when an ATM or POS terminal is due for maintenance or is faulty or if a merchant chooses not to accept the Card. In such cases, your Card may not function properly or be declined. For more information please see the Product Disclosure Statement at www.cashpassport.com.au. 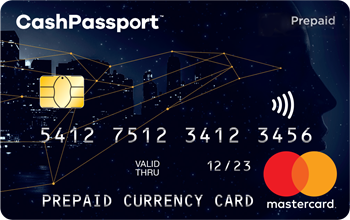 + Before you make a decision to acquire the card, please check www.cashpassport.com.aufor the latest currencies supported. %T&Cs apply. Customer must contact Customer service to report lost or stolen card. Emergency cash can be arranged up to the balance on your Cash Passport, subject to availability of funds at the approved agent location. = T&Cs apply. Wi-Fi is provided by Boingo hotspots. Visit cashpassport.com.au and mastercard.boingo.comfor more information.